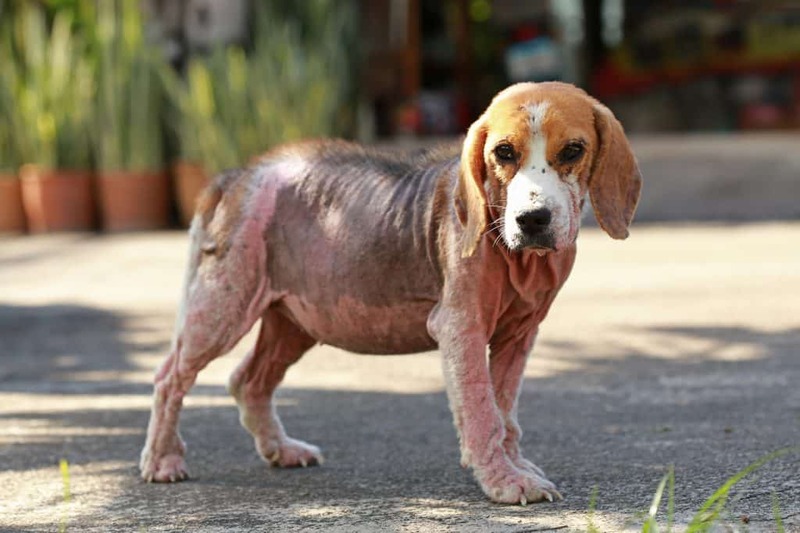 Mange is an irritating skin condition caused by parasitic mites. It isn’t especially common, but it is a condition that all owners should familiarize themselves with. Some will recover from the condition on their own, but others will require assistance to clear the infection. There are a few effective veterinary treatments available, but there are also a few home remedies for mange in dogs that some owners have used successfully. 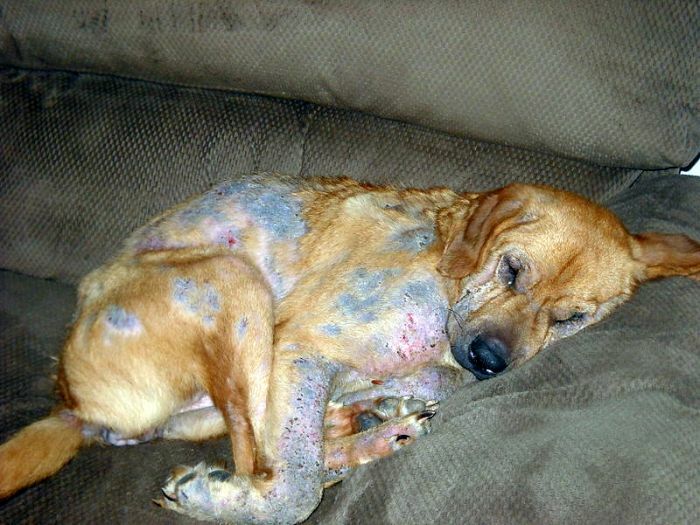 Mange can make dogs pretty miserable, so it is important to treat dogs suffering from the condition promptly. In fact, some mange infections can lead to serious, systemic illness, which can ultimately prove fatal. Additionally, some mange infections are very contagious – they may even spread to you and your family. We’ll explain the basics of mange in dogs below, as well as some of the typical treatments that veterinarians recommend for their patients. We’ll then talk about some of the home remedies and over-the-counter treatments for mange in dogs that may provide some relief for your pet. 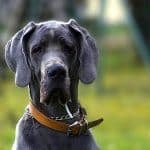 Mange comes in two different forms, and you’ll need to make sure you distinguish between the two, as they are caused by different parasites and require different types of treatment. Demodectic mange (or red mange) – also called demodicosis – is caused by Demodex canis mites. These mites can be found on most dogs, but their populations are normally kept in check by the dog’s immune system. In small numbers, the mites don’t cause dogs much distress – it is only when they are allowed to proliferate that they cause problems. Accordingly, demodectic mange is primarily a disease of young puppies. Most puppies become colonized with the mites shortly after birth (they get them from their mother), and because their immune systems aren’t strong enough to mount an effective defense, the mites can survive and reproduce rapidly, thereby leading to problems. The disease can also afflict adults who are under significant stress or suffering from poor health, as well as those with compromised immune systems. Additionally, some dogs appear to have a genetic predisposition to demodectic mites. Such dogs should usually be spayed or neutered to ensure that this genetic susceptibility to mites is not perpetuated. Sarcoptic mange is often much more serious than demodectic mange. Caused by a mite known as Sarcoptes scabiei, sarcoptic mange can afflict dogs of all ages, including those in otherwise-perfect health. Sarcoptic mites are not part of the normal skin fauna of healthy dogs – dogs who are colonized by the mite typically suffer from an intense rash. Sarcoptic mites readily move from one animal to the next, so they’ll often infect all of the dogs living in a household unless strict quarantine measures are implemented at the first sign of an infestation. They’ll also spread through your home, where they’ll lurk in carpets, linens and furniture, waiting for an unsuspecting victim to walk by. Sarcoptic mites can also infect humans, although human cases of the disease are typically called scabies. Sarcoptic mites typically cause much more significant itching than demodectic mites do. Demodectic mites cause mild to moderate itchiness, but sarcoptic mites can cause constant, unrelenting, intense itching. Another important difference between the two conditions is that demodectic mange typically causes spotty hair loss, while sarcoptic mites can cause more widespread hair loss. While it is possible to treat mange infections in dogs, it is preferable to prevent infestations from occurring in the first place. Be sure to feed your dog a high-quality, nutritious food. 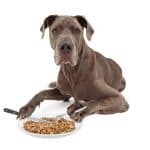 Good health starts with a good diet, and by feeding your pet a good dog food (particularly one that is full of antioxidants) you can ensure that his body has all of the resources he needs to remain healthy. Provide your dog with a secure crate and a comfortable bed. It is very important to ensure that your dog gets plenty of sleep, as this will help support his immune system and ensure his body is strong enough to fight off threats like demodectic mange. One of the best ways to ensure your dog rests comfortably is to provide him with a secure crate, which will help him feel safe, and a memory foam bed, which will support his body and promote proper rest. Ensure that your dog receives all of the vaccinations your vet recommends. Many common diseases of young puppies can ravage your pet’s immune system, which may leave him more susceptible to mange mites. Make sure that your dog gets plenty of exercise. Exercise is a vital component of dog care, which not only helps promote physical health, but it will help support your dog’s mental and emotional well-being too. Most dogs require at least 30 minutes of vigorous activity a day, and high-energy breeds may require twice or thrice as much. Promote emotional and mental health by providing your dog with plenty of safe toys. Toys not only help prevent boredom and the development of destructive behaviors, they also stimulate your pet’s mind, which will help keep him healthier and happier. Bathe your pet regularly with a high-quality dog shampoo. 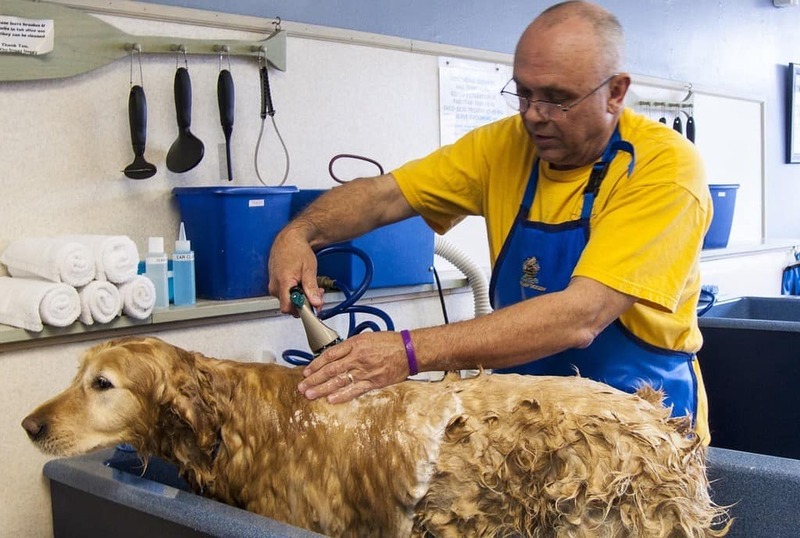 While you will want to use a shampoo designed to kill mites if your dog suffers from mange, you can simply use a regular dog shampoo as a typical course of practice. By keeping your dog’s skin and coat clean and in good condition, he’ll be less likely to suffer from some skin ailments and secondary bacterial infections. Visit your vet regularly. Dogs who are in good health have a better chance of recovering from just about any health problem, and this includes mange. In fact, good health may be all that is necessary to prevent demodectic mites from causing your dog to have problems. Your vet is more likely to notice some health problems than you are, and this will give you the chance to treat them early before the problems worsen. Puppies are often at increased risk of developing mange, so it is important to do everything you can to ensure they get off to a strong start. Check out our new puppy checklist to ensure you give your new pet the best chance of a long, healthy, disease-free life. 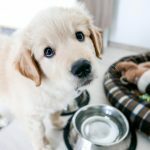 How Do You Treat Dog Mange? Mange can be a serious health problem for dogs, so prompt and proper treatment is imperative. It is usually a good idea to consult your vet if you suspect that your dog is suffering from mange, as it is easy to confuse mange with other skin and coat ailments. You’ll also want to find out which type of mite is giving your dog problems, and your veterinarian will be able to do this with greater accuracy than you will. 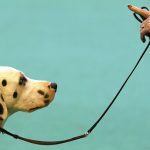 Additionally, veterinary-recommended treatments are typically the most effective way to deal with the issue. However, if you are unable to obtain veterinary care, or you already know which type of mite your dog is suffering from, there are a few over-the-counter treatments you can purchase, and home remedies you can try to treat your dog’s mange. We’ll discuss the treatments available – including those that your vet may recommend as well as those you can do at home – below. Upon bringing your dog into the vet’s office, he or she will likely begin by trying to identify your dog’s problem. Many vets can diagnose demodectic mite infestations by simply examining a dog, but they’ll often need to take skin samples to positively diagnose sarcoptic mite infestations. Mitaban (Amitraz) Dips – Amitraz is the only FDA-approved treatment for demodectic mites in dogs, but it can cause a variety of side effects, including low heart rate, skin irritation and diarrhea. Just discuss the issue with your vet before deciding to use Amitraz to treat your dog for mange. Ivermectin – Ivermectin is an important anti-parasitic medication for dogs. In addition to mange mites, it is used to treat a number of different problems, ranging from fleas and ticks to intestinal parasites. However, ivermectin can be very dangerous for herding breeds who have a genetic mutation that makes them sensitive to the drug. Accordingly, it is imperative that you have herding breeds tested for this mutation before treating them with ivermectin. Milbemycin (Interceptor) – Interceptor is often one of the preferred treatments for demodectic mites in dogs who are sensitive to ivermectin. Unfortunately, treating dogs with Interceptor is quite expensive, which essentially makes it unavailable to some owners. Selamectin – Selamectin is typically applied as a one-spot topical treatment, and it is effective for treating a wide variety of parasites, including heartworms, fleas, and sarcoptic mange mites. Although chemically related to ivermectin, selamectin does not appear to be dangerous for herding breeds. Doramectin – Doramectin is another drug that is similar to ivermectin available from your vet. It doesn’t cause very many side effects, but it is administered via a course of weekly injections. This means you’ll need to take your dog into the vet several times to resolve your pet’s mite infestation. Lime-Sulfur Dips — Lime-sulfur dips have been used for decades to treat a variety of skin problems in dogs. They are probably most commonly used to treat ringworm, but they’ll also eliminate mange mites. However, lime-sulfur dips are quite labor-intensive to use, and you’ll normally need to use them several times to achieve complete mite eradication. There are a few different products — primarily shampoos and dips — that may help you treat mange at home. They’ll usually be a bit more affordable than the solutions your vet has to offer, and they won’t require you to go in for a visit. RenuPlex Healing Shampoo is an all-natural pet shampoo that is designed to treat a variety of skin problems, ranging from mange to hot spots. It is made with a wide variety of ingredients, including colloidal oatmeal, zinc PCA, Aloe vera, spearmint extracts, peppermint extracts, coconut cleansers and rosemary oil. Customer Reviews: The majority of owners who tried RenuPlex Extra-Strength Healing Shampoo were very happy with the results. Most explained that it resolved their dog’s mange problem quickly, and it also received a number of positive reviews from owners of dogs with other skin conditions, such as fleas and ringworm. A few owners did report that this product was a bit too harsh for their pet’s skin, so it is wise to use a dilute solution the first time you apply it to your pet. Once you verify that your dog’s skin will tolerate it well, you can then begin using the recommended concentration. Bottom Line: Frankly, the efficacy of RenuPlex Healing Shampoo is a bit surprising, as it doesn’t contain any true medications. However, the majority of owners who tried it were very happy with the results it provided. It’s also relatively safe, affordable, and backed by a money-back guarantee, so you have little to lose by trying this home mange remedy. Pet MD Benzoyl Peroxide Medicated Shampoo is a moisturizing product that helps to soothe itchy skin arising from a variety of causes, including demodectic mites. This shampoo not only contains two of the same medications used to address skin problems in humans (benzoyl peroxide and salicylic acid), it also contains sulfur, which may help eliminate sarcoptic mange mites. Customer Reviews: Most customers who tried Pet MD Medicated Shampoo were extremely happy with the results. Phrases like “Unbelievable!” and “working wonderfully” appear over and over again in customer reviews, and complaints were exceedingly rare (most complaints related to the odor of the shampoo). It appeared to help address a wide variety of ailments, including mange, idiopathic (unexplained) itching and dry skin. Bottom Line: Pet MD Benzoyl Peroxide Shampoo is probably the best over-the-counter remedy for demodectic mange available, and it may even be effective for treating mild cases of sarcoptic mange. It is easy to use and effective, and it is very reasonably priced too. Vet Basics Lime Sulfur Dip is a high-quality product used for treating several different skin conditions in dogs, including sarcoptic mange. It also exhibits antibacterial and antifungal properties, which can help to prevent the type of secondary infections that often occur in conjunction with mange. Customer Reviews: Most customers who tried Vet Basics Lime Sulfur Dip reported that it was quite effective for treating mange and other skin ailments. Many also reported that it was easy to mix and apply to their pet. A few owners did note that the product has a very powerful “rotten eggs” smell, but this is to be expected, as it should be with any sulfur-rich product. Bottom Line: Sulfur-based dips are often unpleasant to use, given their significant odor, but there are few better over-the-counter remedies available for treating sarcoptic mites than Vet Basics Lime Sulfur Dip. And it is not only effective, but affordable and easy-to-apply as well. Note that you will want to wear latex gloves while applying this shampoo, and you’ll want to bathe your pet in a well-ventilated area. This product can stain light-colored items, including clothing, carpets and jewelry. Veterinary and over-the-counter treatments are certainly the best options for treating dogs with mange, but there are also a few home remedies for dog mange you can try. The efficacy of these remedies will vary from one dog to the next. None of these treatments are likely to be completely effective against serious sarcoptic mite infestations, but they may provide some value in treating minor demodectic mite infestations. If your dog is suffering from a mild case of localized mange, you can apply a thin film of olive oil to the affected area. The olive oil may be helpful in suffocating the mites, and it’ll also help soothe and moisturize your dog’s skin too. You may have to cover the afflicted area with a bandage or piece of clothing to prevent your dog from licking the olive oil off. Note that while most authorities recommend using olive oil, most non-toxic, vegetable-based oils (such as corn oil or sunflower oil) would probably yield similar results. Just be sure that you don’t cover large portions of your dog’s body with any oil, as this may be dangerous (not to mention expensive!). Yogurt is a popular, if messy, home remedy many people use to treat mange and other skin problems in dogs. Yogurt can help to smother mites and other parasites and it may help moisturize your dog’s skin, which will help alleviate his itching. Additionally, yogurt is full of beneficial bacteria, which may help support skin health and help prevent fungal and bacterial infections from setting in. Use the plainest yogurt you can find and be sure to select a variety with no added sugar. As with plant oils, you only want to use this remedy in relatively small patches of skin. You may also need to cover the yogurt, as your dog may be inclined to lick it off right after you apply it. Honey is another all-natural ingredient that some owners have used to treat mange. Honey has some antibacterial and antifungal properties that may help support skin health, and because it is thick and heavy, it’ll likely smother any mites or parasites on your dog’s skin. Be sure that you select an all-natural, unflavored honey, as some of the things used to flavor honey can be toxic to dogs. You’ll have to cover the honey with a light bandage or piece of clothing, as few dogs can resist honey. As with the other treatments mentioned above, you’ll want to use honey for localized mange infections only. Aloe vera extracts are soothing products that will help reduce your dog’s itchiness and help support healthy skin. You can apply it as often as every 12 hours or so, and it may even help to suffocate some of the mites living on your dog’s skin. Be sure that you select a product that is comprised of 100% Aloe vera extract, and does not contain any alcohol, which could dry out your dog’s skin. Most dogs will ignore Aloe vera, as it doesn’t taste very good. However, you’ll still want to observe your dog carefully to ensure that he doesn’t ingest any. The internet is full of well-meaning, but potentially dangerous advice for treating mange in dogs. Not all home remedies are dangerous – the ones mentioned above are largely safe – but it is important to recognize that just because something is natural does not necessarily mean it is safe. For example, many websites promote the use of dips that contain borax. Borax is used in a number of soaps and detergents, and it is also used as a pesticide. But borax is not only toxic to bugs, it is toxic to dogs too. Among other things, borax can cause red, irritated skin, and it has even been known to trigger peeling skin in some cases. Ingestion can also cause serious illness – it only takes about 5 grams to kill a small pet. This is especially troubling, as many of the websites recommending borax-based solutions also encourage owners not to rinse the dip product off. This means your pet may end up ingesting quite a bit of borax during a multi-week treatment regimen. Mange, like a lot of other skin problems, doesn’t always occur in a vacuum. In fact, it often causes dogs to suffer from secondary bacterial and fungal infections. This complicates treatment significantly, and these types of infections can lead to serious, long-term health problems. This highlights the importance of using effective mange treatments as soon as possible. By eradicating the mites quickly, you’ll be able to reduce the chances of your dog contracting a secondary infection. If your dog is already dealing with a secondary infection, you’ll almost certainly need veterinary assistance to eliminate the mites and wipe out the infection. 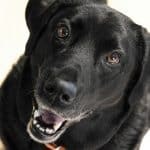 However, there are a few things you can do that may help reduce the likelihood of your dog contracting secondary infections. This includes obvious steps, such as bathing your pet with a skin-supporting product (such as those referenced above), as well as following the immune-boosting recommendations listed earlier. You can also provide your dog with a good probiotic supplement. Probiotics are beneficial bacteria, which are thought to help promote intestinal health, and they may also help promote good skin and coat health. If you discover that one of your dogs is infested with sarcoptic mites, you’ll need to take steps to ensure that the rest of your family doesn’t become infected too. The sarcoptic mites that infect dogs are not thought to be able to complete their entire life cycle on humans, but they can cause problems for the people living in your home as long as your dog remains infested. In fact, the mites won’t only be on you and your dog, but most of your belongings too. This is part of the reason that it is necessary to use mange treatments several times in succession when trying to eradicate the bugs. But you’ll also want to clean your home thoroughly during the treatment process. This includes sweeping, mopping and vacuuming your floors, and washing all of your clothing and linens too. You may even find it necessary to steam clean your furniture upholstery. If you start suffering from itchy skin while treating a dog with mange, be sure to visit your doctor promptly. Sarcoptic mange (scabies) is relatively easy to treat, but it normally requires you to coat your entire body (from the chin down) in a mite-killing cream. You’ll usually have to sleep in the cream overnight to give it enough time to work. Both types of mange are serious, but manageable health problems, which necessitate prompt treatment. And while there are a few home remedies that may provide relief for dogs suffering minor infestations, you’ll likely need one of the over-the-counter or veterinary remedies discussed above.